He was born in Milan on 21 October 1928 to Alfredo Pinelli and Rosa Malacarne. The early part of his life was spent in his native Porta Ticinese district of the city. After completing elementary school he had to start work, initially as a waiter and later as a warehouseman. He carried on reading: this was a lifelong habit of his. In 1944 when he was 16 he took part in the antifascist resistance as a runner for the “Franco” Brigade, working with a group of anarchist partisans who were his first encounter with libertarian thought. In 1954 he joined the railways as a labourer. In 1955 he married Licia Rognoni whom he met at an evening Esperanto class; they soon had two daughters, Silvia and Claudia. 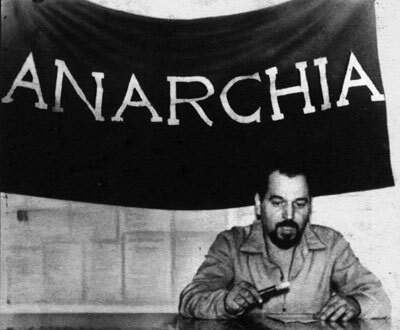 In the early 1960s an anarchist youth group was formed in Milan (the Gioventu Libertaria) with a little over twenty members who included Amedeo Bertoli who in 1962 made headlines as a member of a group that kidnapped the Spanish vice-consul in Milan in order to press for (and achieve) the commutation into a prison term of the death sentence that had been passed on an anarchist in Francoist Spain. Pinelli - just ‘Pino’ to his friends and colleagues - at 35 was the oldest of the group, but that was not a problem: his cheerful, outgoing personality made him “good company”. And when in 1965, after ten years without a local, one was opened in the Via Murillo, Pino was among the founders of the “Sacco and Vanzetti Circle”. On those premises there was a get-together of young anarchists from all over Europe in 1965. After eviction, Milan’s anarchists moved premises and on 1 May 1968 the “Ponte della Ghisolfa” Anarchist Club in the Piazzale Lugano on the outskirts of the La Bovisa working class district was opened. It was called after the former viaduct, the pillars of which can be seen from the Porta Garibaldi railway station where Pinelli worked. In 1968 the winds of challenge blowing from France reached Milan. Pinelli was active on many fronts: as an anarchist, he was one of those who kept the club open, organising an efficient book-service and he was one of the organisers of a busy series of evening lectures. Capitalising upon his free rail travel privileges (as a railway employee), he kept in direct contact with “outside” comrades, among them Luciano Farinelli in Ancona, Aurelio Chessa in Pistoia and Umberto Marzocchi in Savona. He was also in frequent contact with Alfonso Failla in Marina di Carrara, also holidaying there with his family. As a worker Pinelli was also involved in trade union affairs, especially helping to refloat the USI, a branch of which opened on the club premises. And the Milan Transport Authority’s CUB (rank and file committee) chose the club as its own base, leaving only in the wake of the bombing on 12 December 1969: that move was prompted by the crackdown on anarchists. Anarchist circles in Milan were all excitement, with libertarian groups emerging in lots of high schools and in the factories there were anarchist workers and frequent early morning leafletting campaigns. Books, pamphlets were produced and some of the older newspapers underwent a revival. Milan’s anarchists felt the need to open a second clubhouse, this time in the southern part of the city. Among those most committed to the preparation and opening of the Via Scaldasole Club (in the Ticinese district) was Pinelli. On 25 April 1969 two bombings struck at the Central Station and the Show Grounds. Inquiries were directed towards libertarian circles and a number of anarchists were arrested: this was the start of a campaign of criminalisation that received a further boost in August when some train bombings were also credited to anarchists. There was also a rumour around to the effect that Pinelli, the anarchist railway worker, might be implicated. Pinelli and his “Bandiera Nera” (Black Flag) group bridled at this and took exception and denounced this black propaganda, launching - after the model of the British “Black Cross” at around the same time and the Russian Black Cross from the 1920s - the Anarchist Black Cross, specifically committed to concrete solidarity with arrested comrades, but also to publication of a counter-information bulletin. Pinelli was the highest profile anarchist in Milan and was regularly summoned to police HQ over applications for licences, meetings, etc. The person he dealt with more often than not was a young police inspector, approachable in his manner, elegant and friendly: Luigi Calabresi. So when, on the afternoon of 12 December 1969, right after the Piazza Fontana bomb outrage, Calabresi arrived at the Via Scaldasole Club and asked Pinelli to come to the station, Pinelli readily agreed, climbed on to his motor bike and followed the policeman’s car. At headquarters, Pinelli found many of Milan’s anarchists in one large room. They like him had been brought in for questioning about their alibis. Within 48 hours, the maximum “police custody” allowed under the laws at the time, those arrested had been released and a few had been transferred to San Vittore prison. Pinelli was detained at headquarters longer than the law allowed for. He was interrogated. Then, at around midnight on 15-16 December his body “flew” from a room belonging to the Political Bureau on the fourth floor and hit the ground. The initial conflicting versions of the police story suggested that the truth could not have been the official story of a “suicide”. Pinelli died in Milan at the Fatebenefratelli Hospital on the night of 15-16 December 1969. The political-legal follow-up to his killing, interwoven with the entire story of the Piazza Fontana massacre, especially with the “Valpreda affair” which over the years backfired on those in power. Clumsy attempts to hush everything up, culminating in the “active affliction” thesis put forward in his finding by Judge Gerardo D’Ambrosio, merely highlighted a truth that has yet to find its place in the official record. Dozens of books, movies, plays, art installations and songs were devoted to Pinelli and his murder and not just in Italy. Here let us cite only two of them: Nobel Prize-winner Dario Fo’s Accidental Death of an Anarchist and Enrico Baj’s massive painting Funeral of the Anarchist Pinelli. From: Sicilia Libertaria, December 2005 . Translated by: Paul Sharkey. Our comrades from the Centro Studi Libertari / Archivio Giuseppe Pinelli, Milan are fundraising to create a public history project, dedicated to the life of Giuseppe Pinelli. Our comrades say: "Our aim is to collect witness accounts and documents pertaining to Giuseppe Pinelli, as well as to the research and inquiries carried out over the years, and to make the collected material available to the public at large. The story of the «anarchic railway worker» will be the core of a common, participated history, illustrating a specific historic period and filling the gaps eluding documentation and witness accounts, with the goal to add a further tool to allow for today’s world to interpret itself."